Spring is a perfect time to enjoy the patio, cookouts and the great outdoors, but it gets chilly at night, so problem solved with an easy to use patio heater. 1. What else do I need besides the heater itself? A: A propane tank (order online or get at a local hardware store) and AA batteries. 2. How long will the flame last and how will I know when it is done? A: One tank lasts about 10 hours of continuous flame and it will start to fade as the propane gets low. Have a second tank on standby duty and never run low! Practically a tank can last a month or more depending on use. Many hardware stores will swap out the tank with another one so you don’t have to wait around for it to be refilled, or some gas stations offer a refill service (or a swap out too). 3. Do I have to muss around with a pilot light? A: Funny enough, some of the very expensive patio heaters make you keep a pilot light on, but this is pilotless direct ignition so can be ready anytime. When not in use, best to close the propane valve on the tank as well as turn off the unit. When you are ready to use, simply turn the propane valve to the “on” position and then turn the unit on and enjoy. 4. How long does the initial assembly take? A: Best to allow an hour to get familiar with the unit and assemble it. According to one review “instructions were easy enough for an 8th grader to use”. Some have done it in 1/2 hour or less. 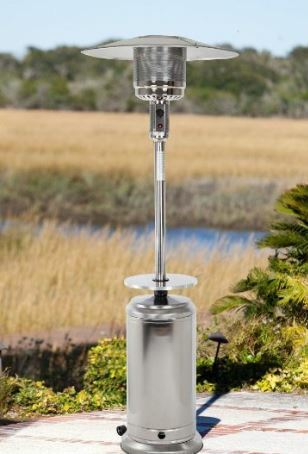 The propane powered upright patio heater will heat the surrounding area and keep guests cozy in the evening. One of the best-selling and most positively reviewed propane patio heaters is the Fire Sense unit with fast heating and it looks good too. 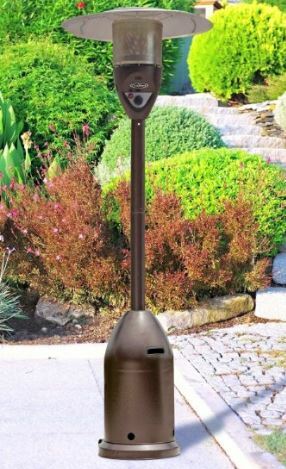 5 Where can I read reviews about this #1 selling Patio Heater? A: Read the Fire Sense Patio Heater Reviews. The price is absolutely right, these heaters used to cost over $400, but now they are a fraction of that. The flame is adjustable and it puts out a whopping 46,000 BTU at maximum. This unit burns quietly and evenly and provides the right ambience for you and your guests. Do not use this unit indoors, it is for outdoor and patio use only. 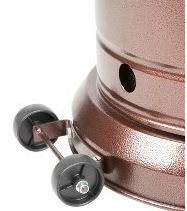 A good patio heater will have wheels on the bottom to allow it to be moved around easily so it can be placed where it is needed. Simply insert a propane tank in the center of the heater, follow the directions to hook it up properly and close the cover. This heater is designed to run on a standard 20 lb. propane tank (LPG tank not included). The propane consumption rate is about 10 hours using a full 20 lb. tank. 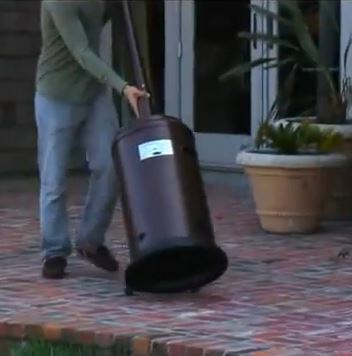 The easy lift tank cover makes it easy to change out tanks. 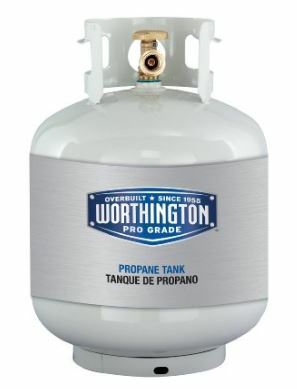 Many gas stations, Home Depot, Lowes etc.. have the propane tanks and will swap out the tank for a reduced fee. You can buy 2 tanks so you can always have a full spare and never run out! Enjoy the warmth as you linger outdoors longer – especially in the shoulder seasons of spring and fall. The full instructions come with the unit, so be sure to follow them. They estimate it will take you 60 minutes to completely assemble and test this patio heater. Check that all parts are there before beginning assembly. First the wheels are attached to the base with 6 bolts (M6), then the 3 post supports are attached to the base like in the picture above with M8 bolts. (included). Next the lower post is added to the post supports with bolts. Then the upper post goes on the lower post and the two pieces are screwed together with screws provided. The tank housing then goes over the base. It just rests on the base so it can be lifted up anytime to put in or replace the propane tank. Next the head assembly is mounted on the top of the post with the gas hose going down inside the middle of the post. The top reflector panels go on next and all parts are fastened into place. 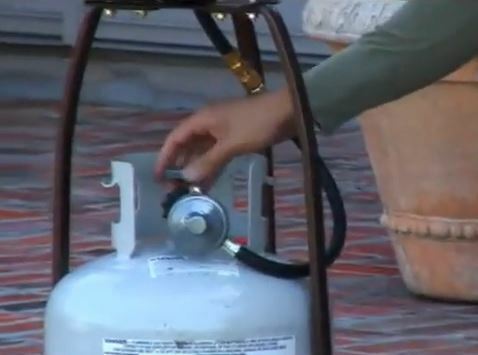 Now connect the hose bottom to the propane tank. Handle the propane tank as directed – you can find more about handling propane tanks in your library or even with your fire department as it says in the manual. That goes for those using propane tanks for bar-b-que as well. This appliance must only be used outdoors in a well ventilated area. It comes with the pressure regulator and hose, so you just need to purchase a 20 lb. LPG propane tank. 1. Make 2-3 ounces of leak check solution (one part liquid dishwashing detergent and three parts water). 2. Apply several drops of solution where hose attaches to regulator. 3. Apply several drops of solution where regulator connects to cylinder. 4. Make sure all patio heater valves are OFF. 5. Turn cylinder valve ON. appear, call the customer service hotline mentioned in the manual. service hotline listed in the manual. Manual recommends to do complete leak check whenever gas connections are loosened or removed. Hopefully there is no leak as is the case most of the time when hose is installed correctly. Follow the compete instructions in the manual, these here are provided as a guideline before you receive your unit. 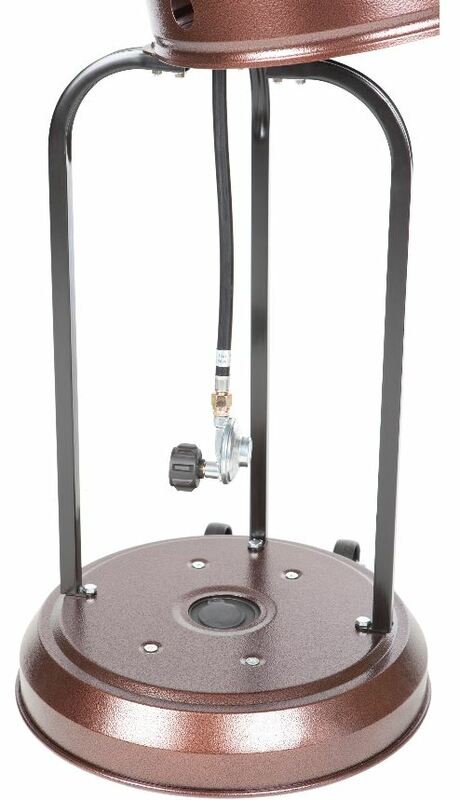 This Fire Sense propane gas powered outdoor patio heater comes with a 1 year limited warranty. If all is well, it’s time to get the party started.